[General description] Moodily lit head and upper body portrait of the Professor A.E.V. Richardson, highly accomplished public servant, agricultural scientist, academic and wheat breeder. 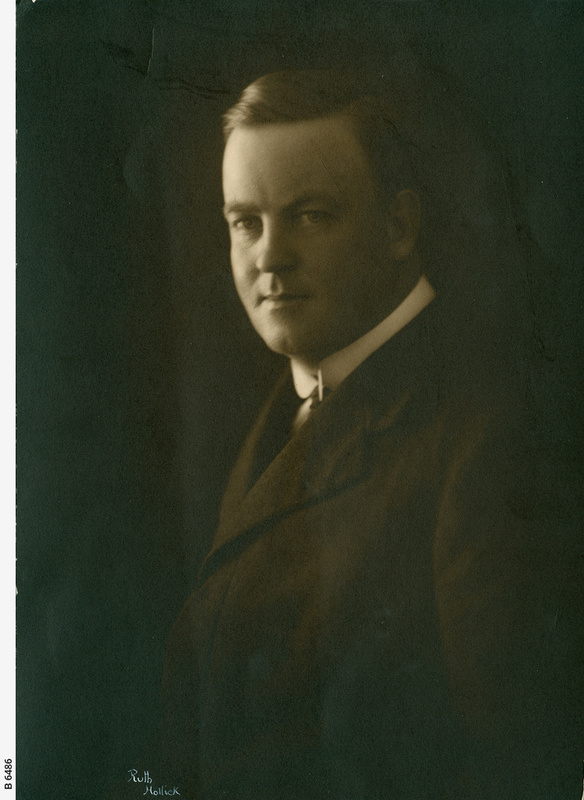 [On back of photograph] 'Professor Arnold Edwin Victor Richardson, D.Sc., M.A. (in 1929) / Born September 12th, 1883 / Son of George Edwin Richardson / Educated at Roseworthy Agricultural College and the University of Adelaide / Assistant Director of Agriculture, South Australia from 1908-1910 / Superintendent of Agriculture, Victoria from 1911-1924 / Commissioned by the Victorian government in 1918 to visit the U.S.A. and Canada to report on agricultural education and research / This led to the establishment of the University School of Agriculture, Melbourne / Director School of Agriculture, University of Melbourne from 1919-1924 / Director of Waite Agricultural research Institute and Waite Professor of Agriculture, University of Adelaide since 1924 / Commissioned by the University of Adelaide and the South Australian Government in 1926 to visit the agricultural research institution of Europe, the U.S.A., Japan and South Africa / Appointed a member of the executive committee of the Council for Scientific and Industrial Research, Australia in 1927 / Represented the Commonwealth of Australia at the first Imperial Agricultural Research Conference, London, 1927 / member of Australian Delegation to the Imperial Economic Conference at Ottawa, 1932'.